Sorry, folks, I've got Chicago on the brain on this one. I've got a husband on call this weekend, a friend skiing in Park City (I'm so jealous), my first Saturday of the year where I finally have a less hectic schedule that allows for more play time, and there's no snow to keep me busy outside with my snowshoes. With a snowstorm in the east, the Olympics in preparations in the west, the Super Bowl in the south, it's easy to say there are many milestones in the two days ahead. Here in Chicago one would think there isn't much going on for the weekend since these other geographic corners of the continent are garnering far more attention. But on the contrary, there are plenty of activities to keep the body moving without straying too far from home. Cycle for Survival. Grab your cycling shoes and head to Equinox in the Loop for this fundraiser running from 10 a.m. to 2 p.m. on Saturday, Feb. 6. 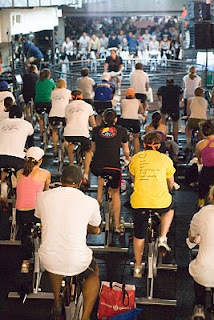 The fitness center will turn into spin central with 100 teams of up to eight people pedaling to raise money for Memorial Sloan-Kettering Center. When participants aren't riding, they can enjoy yoga, stretching and more (Berry Chill will be on hand to help refuel the cyclists, too). Read more details about the event here or make a donation at cycleforsurvival.org. CorePower Yoga. Throughout the year, CorePower Yoga offers targeted programs from teacher training to yoga bootcamp. While Boot Camp gets underway on Sunday, Feb. 7, the Gold Coast location is previewing its Live Lean program on Saturday, Feb. 6, at 10:30 a.m. The 10:30 a.m. slot is usually reserved for a yoga sculpt class, but instead of paying for yoga, you can check out the Live Lean program for free. But check the schedule online before you go--earlier in the week the LiveLean session was listed but five minutes ago, the class appears to have switched back to yoga sculpt. If that's the case, stay tuned for other freebie previews. lululemon athletica. Yoga, and now running, reigns supreme at Lululemon, not only with the clothes offered but within the store's community. At the four stores in Chicago--900 N. Michigan, Rush and Walton, Bucktown, and Lincoln Park--there's plenty to do all weekend. Check the stores' calendars for details but know that you can join the running club at 900 N. Michigan on Saturday mornings, participate in community yoga on Sundays, a cardio class at Rush and Walton. Rowfit. This indoor rowing and training studio just opened on February 1 and provides a place to train in the West Town area of the city, 1064 N. Milwaukee. If you've never rowed before, don't despair. Not only is it easy to learn, but it's a great exercise that works the entire body. It's hard to pass up attending at least once--the first class is free. Also, stay tuned for more information about this new facility in an upcoming post.